Gokyo Lake This trek includes the visits to Namche and Tengpoche and adds an incredible hike to Gokyo lake. This trek gives you plenty of beautiful views of Everest and other nearby giants. 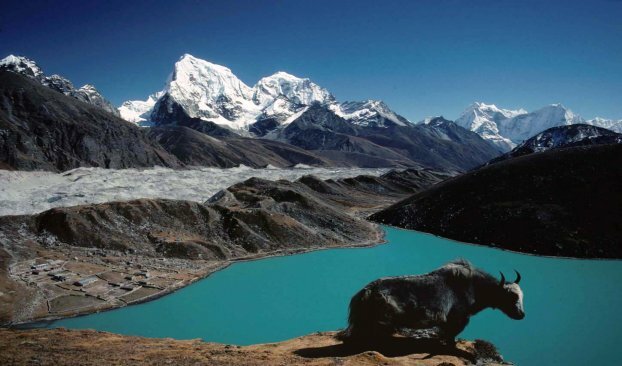 The Gokyo lake area is surrounded by mountainous valleys, alpine lakes, and numerous glaciers. Day 01: Depart Kathmandu via air, for Lukla (8800ft) and a short trek (2-3 hours to) to Phakding at 8,661 feet. The flight into Lukla is similar to the Everest View flight for views and beauty. Day 02:The trail climbs gradually following the river and enters the Everest National Park at Jorsale, then crosses the river and climbs Steeply to Namche (11,100 feet). (4-6 hours). Day 03:Namche/ Rest day or day hide possible. Namche is capital of the Khumbu district and offers many ways to spend a day. Day 04:Tengboche. We Climb the ridge above Namche and descend to the Dudh Koshi Riover before climbing again to Tengboche Monastery (12664 feet). (4-6 hours). Devoche is slightly further (20minutes) a charming village. Day 05 :Tengbuche (3680metees) to Dole (4000meters)/ 5 hr to 6 hr. ay 06: Dole to Machhermo (4470 meters)/ 5-6 hr. Day 11: Namche or further on. Day 13: Fly to Kathmandu by noon.